Wild West Bedding for my Little Cowboy - It's Gravy, Baby! Bryson’s Cowboy Western room was the first completed room in our home. My husband put a lot of hard work into the walls and I enjoyed making it come alive with the details. I never found the “perfect” cowboy bedding set though, so we’ve been using a sleeping bag set as Bryson’s bedding. It’s cute, but still, it’s a sleeping bag. It was time for some real big boy bedding. We plan to move him out of the toddler bed and into a twin size bed soon. It’s just a matter of finding the right bed or hubby building one. 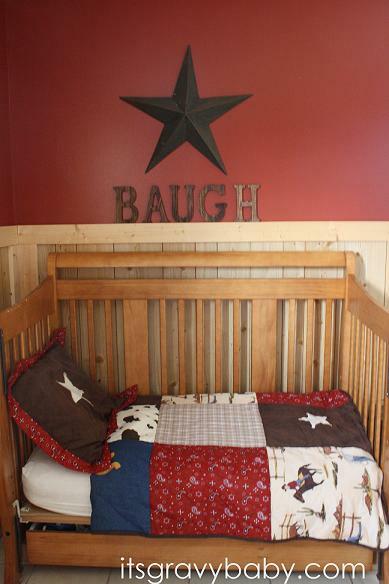 So, when I saw the selection of custom toddler bedding from Beyond-Bedding.com, I hoped they would have the perfect western set for my little cowboy. And they did! I went ahead and ordered a twin size which came with a comforter, sham, bed skirt, and window valence. The set is even cuter in person and it completed the cowboy look I was going for. This set is great quality and I know we’ll get several years of use out of it. Once we find a rustic looking bed, I’ll add the bed skirt. I’m also thinking about ordering some of their cowboy curtains. If the cowboy look isn’t for you, don’t fret! Beyond-Bedding offers everything from Dinosaur bedding to zebra print bedding and everything in between! There are also accessories to match the sets, so you can give the room a finished look. I received this bedding set free of charge in exchange for this post. No other compensation was provided. All opinions remain my own, as always.